Warsaw-born Mieczslaw Weinberg (more frequently seen in the Russian variant as Moise Vainberg or Vaynberg if you look at the 1980 New Grove) was the son of a violinist and composer working in the Polish theatre. His First Symphony resulted in Vainberg being invited to Moscow by Shostakovich. The two were close and, rather like Holst and Vaughan Williams, had a relationship of mutual trust under which they shared views on work in progress. Nielsen's Sixth Symphony. The adagio saunters along in a poignant nostalgic haze; a lovely inspiration. The symphony is dedicated to the composer Revol Bunin (1924-1976). We must hope that Chandos will also turn to Bunin's symphonies as well as those of Shtogarenko, Lokshin and Ovchinnikov in due course. 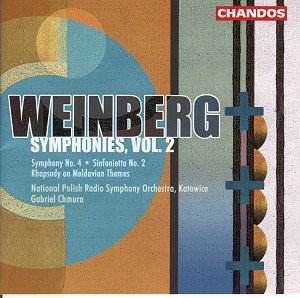 There are twenty-two Vainberg symphonies in total and two sinfoniettas of which the Second Sinfonietta is here. Like the First it is in four compact movements. While the Fourth Symphony has an ambiguous knockabout element this work is grave and haunted. Its most memorable aspect is presented in the Andantino which is a miracle of concise questioning - halting and faltering lyricism - (tr.9 2.34). The Rhapsody on Moldavian Themes is an effective and sensitive work in the pattern of the Enescu Rumanian rhapsodies. It is bright and breezy, dreamy too especially in the slow and swayingly massive build-up where the expansive writing of Khachaturyan is recalled. It could comfortably be placed in the company with Kabalevsky's overture to Colas Breugnon and Shostakovich's Festive Overture and no-one would blink. At the time of its premiere it came in for some mild stick from Khrennikov and Shtogarenko. Olympia have done a superb job of making many hours of Vainberg available. I rather hope that Chandos will think of filling the gaps left in the symphony cycle by Olympia rather than duplicating their work even if Olympia is now defunct. Due to the work of Claves and Olympia there is quite a lot of Vainberg on the shelves although so much of it depends on Olympia who seem now to have dropped out of the scene. Chandos are set to make a major and enduring contribution if the frst two discs are anything to go by. Don't let this one slip into the background and don't imagine that Vainberg is some second league Shostakovich. He has his own perspective and the sharpness, invective, Russian passion and desolation are distinctively his own. The notes are by that outstanding writer on Soviet musical matters Per Skans. He and David Fanning have done superb work to excavate the massive and thoughtlessly derided. This is a classic entry with a greater emphasis on populism, poignancy and nostalgia than in volume 1. I await volume 3 with great anticipation.